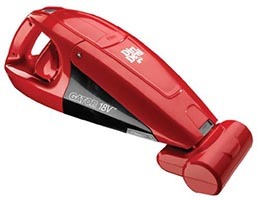 Dirt Devil says their BD10175 18-Volt Cordless Hand Vacuum, or the “Gator,” packs quite a power punch for what they’re selling it for – they even say it has extra features beyond those volts, too. Will their claims stand up under scrutiny? Let’s take a look and find out. The Gator is one of Dirt Devil’s stronger handheld vacuums, with 18 volts of power. It’s an easy comparison to make, but it’s an apt one: that’s the kind of power you want in a cordless stick vacuum, but in a much smaller package. If there’s one good, and moreover, startling example of that high power, it’s how well this vacuum does on carpet. An included brushroll attachment makes short work of even pet hair on upholstery and carpet. If you’re wondering when you might use a handheld vacuum on carpet, just look at what’s covering the footwells of your car or the stairs to your second floor. And if this vacuum can do that well on carpet, it’s obvious how well it’ll do on much easier surfaces. With a 2 ¼” wide nozzle, the Gator needs much fewer passes to get through messes – there’s no cutting a narrow trail through spilled cereal with this vacuum. A D-shaped handle contributes to the vacuum’s agility, and a built-in crevice tool extends for hard-to-reach areas. Dirt Devil opted to save space for you by designing this vacuum to use a cell-phone style charging plug, so you don’t have to worry about storing a charging mount as well as the vacuum. The charging time for the NiCad battery is 24 hours, but its charger is Energy-Star rated, and if you’re doing small messes the Gator can easily go for over a week on a single charge. The Gator is in a nice sweet spot between solid and light at 4.1 pounds. Any heavier and that D-shaped handle wouldn’t support it, and the vacuum is light enough that the handle just makes it more agile. Dirt Devil decided to go with a simple screen filter for this vacuum. It keeps the overall cost down, and it’s easy to wash with water. There’s no removing a dust bin and accidentally spilling it or fiddling with fitting in with the Gator. Instead, the front of the vacuum flips up, just like an alligator’s mouth (hence the name!) and you just tip it out over the trash can. As I mentioned above, there’s a crevice tool built into the vacuum itself (if you’ve ever lost a useful vacuum accessory like that, you’ll definitely appreciate that feature). Even more significant though is the Gator’s wonderful brushroll attachment – it works much better than many cordless stick vacuums for carpet, and it’s just an attachment on a handheld! This vacuum takes some care to use, but it’s really not that much of a chore – it’s just NiCad batteries take a little more attention to charge properly so they maintain their lifespan. Otherwise, it’s a pretty solid Dirt Devil vacuum. Dirt Devil knows well how solidly they built it, speaking of the Gator’s reliability – it comes with a three year limited warranty, a good year longer than the average for most handheld vacuums. This vacuum won’t put a dent in your wallet – it costs perhaps a little more than the lower end of the spectrum, and you really don’t want to be buying at the lowest end of the spectrum if you’re smart, anyway. Dirt Devil advertises the Gator mainly on the basis of its power, which in and of itself could arguably be reason to name it a vacuum to go out of your way for, especially for the price it’s sold at. But it’s really more about the Gator’s brushroll attachment, which could be sold at a much higher price – if you have carpeted stairs in your home, a lot of upholstery, or really want to get your car clean, this is the vacuum for you.